4 Submission doc. 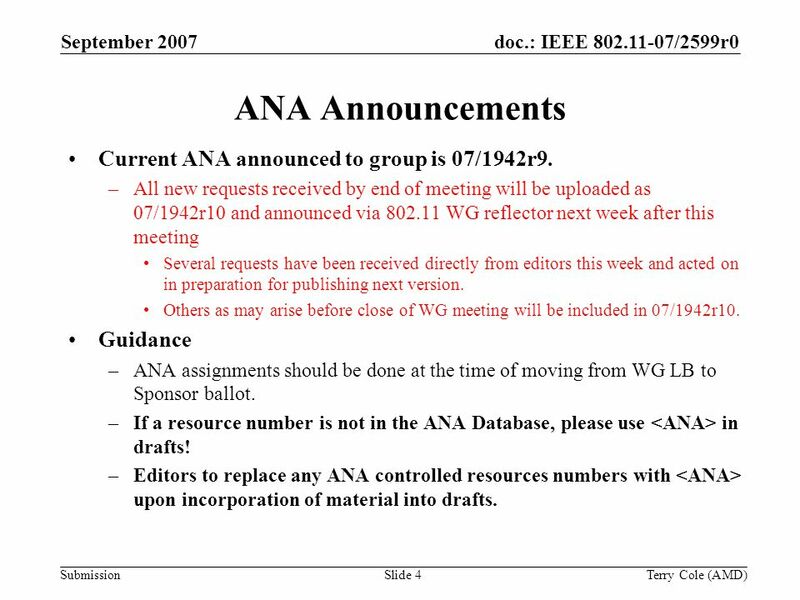 : IEEE 802.11-07/2599r0September 2007 Terry Cole (AMD)Slide 4 ANA Announcements Current ANA announced to group is 07/1942r9. –All new requests received by end of meeting will be uploaded as 07/1942r10 and announced via 802.11 WG reflector next week after this meeting Several requests have been received directly from editors this week and acted on in preparation for publishing next version. Others as may arise before close of WG meeting will be included in 07/1942r10. Guidance –ANA assignments should be done at the time of moving from WG LB to Sponsor ballot. –If a resource number is not in the ANA Database, please use in drafts! 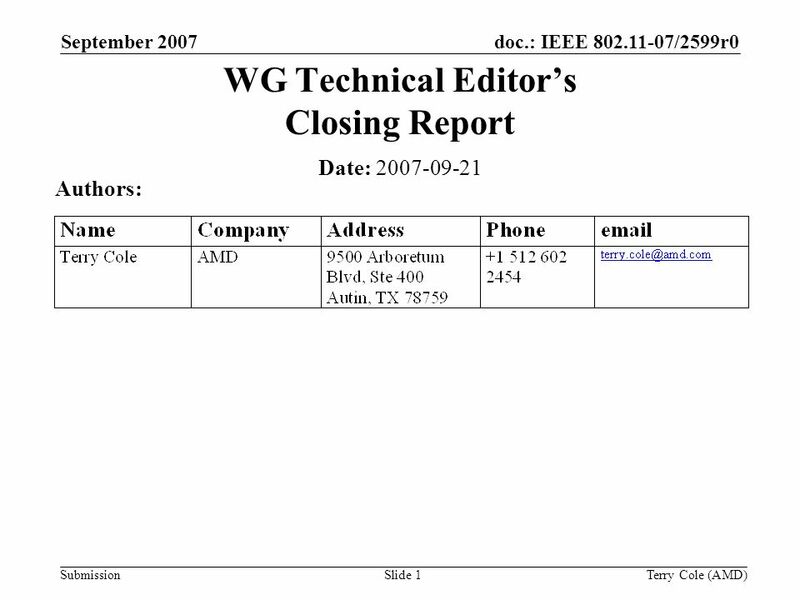 –Editors to replace any ANA controlled resources numbers with upon incorporation of material into drafts. 6 Submission doc. 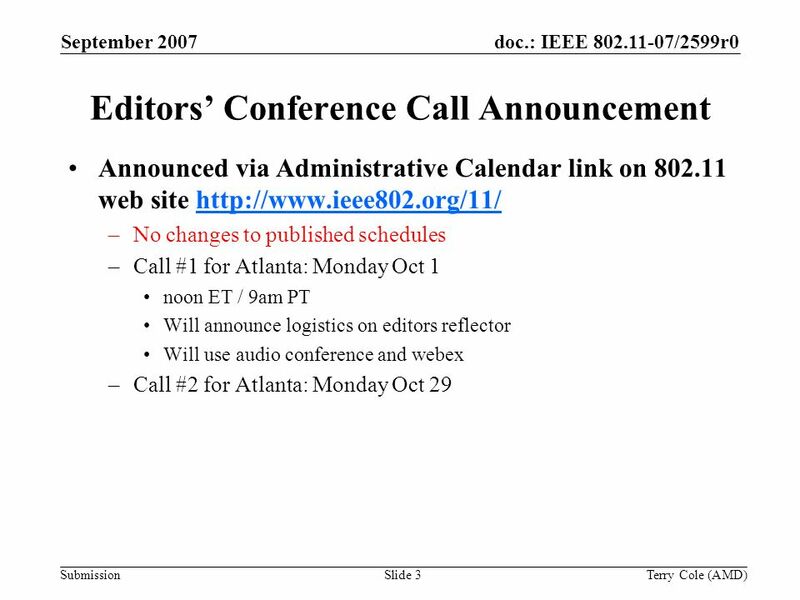 : IEEE 802.11-07/2599r0September 2007 Terry Cole (AMD)Slide 6 Editors Meeting Reviewed inter-editor coordination and timelines –No new problems identified –Reviewed and coordinated renumbering project of drafts to align with IEEE 802.11-2007. Expect this to complete shortly after the close of this meeting. 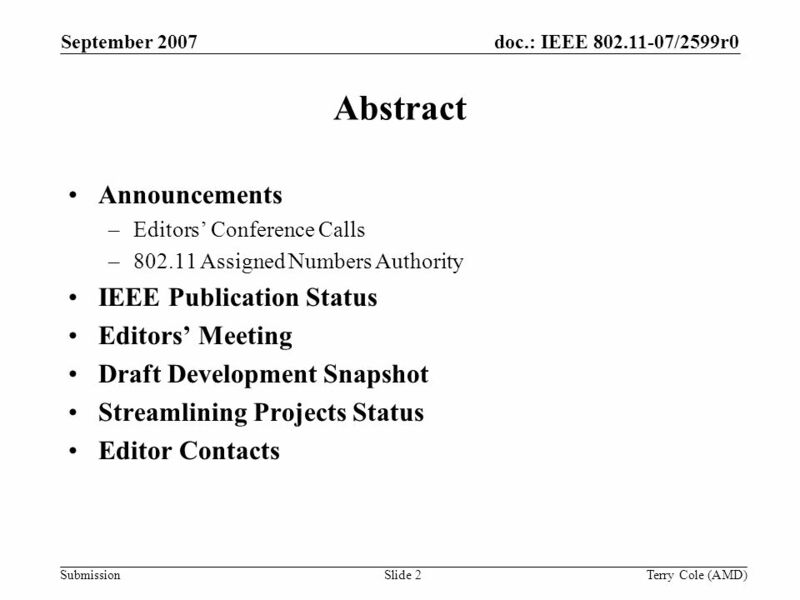 All baseline references should now be to IEEE 802.11-2007. –Reviewed timeline order. See separate slide. 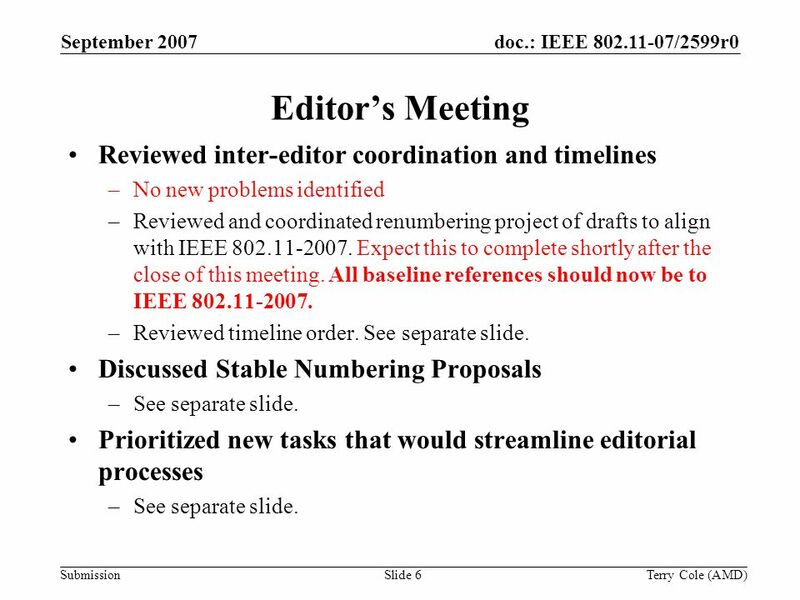 Discussed Stable Numbering Proposals –See separate slide. 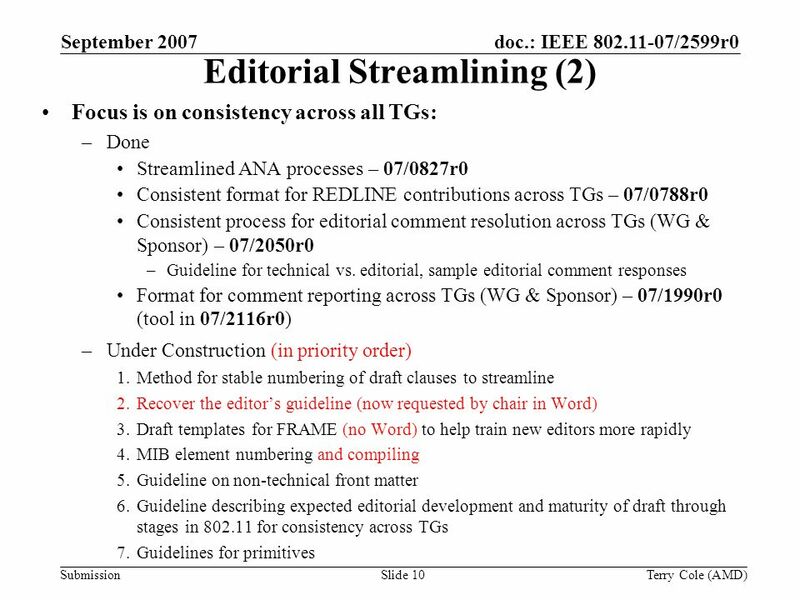 Prioritized new tasks that would streamline editorial processes –See separate slide. 7 Submission doc. 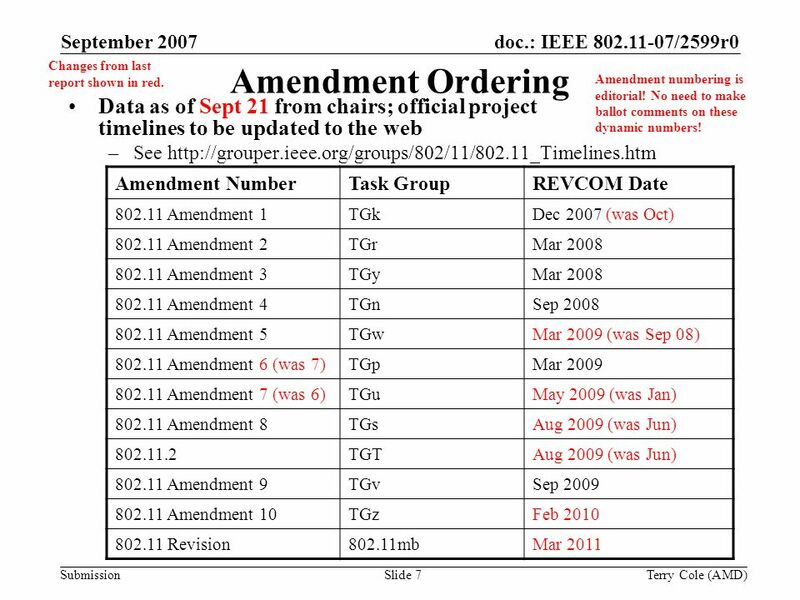 : IEEE 802.11-07/2599r0September 2007 Terry Cole (AMD)Slide 7 Amendment Ordering Data as of Sept 21 from chairs; official project timelines to be updated to the web –See http://grouper.ieee.org/groups/802/11/802.11_Timelines.htm Amendment numbering is editorial! No need to make ballot comments on these dynamic numbers! Amendment NumberTask GroupREVCOM Date 802.11 Amendment 1TGkDec 2007 (was Oct) 802.11 Amendment 2TGrMar 2008 802.11 Amendment 3TGyMar 2008 802.11 Amendment 4TGnSep 2008 802.11 Amendment 5TGwMar 2009 (was Sep 08) 802.11 Amendment 6 (was 7)TGpMar 2009 802.11 Amendment 7 (was 6)TGuMay 2009 (was Jan) 802.11 Amendment 8TGsAug 2009 (was Jun) 802.11.2TGTAug 2009 (was Jun) 802.11 Amendment 9TGvSep 2009 802.11 Amendment 10TGzFeb 2010 802.11 Revision802.11mbMar 2011 Changes from last report shown in red. 8 Submission doc. 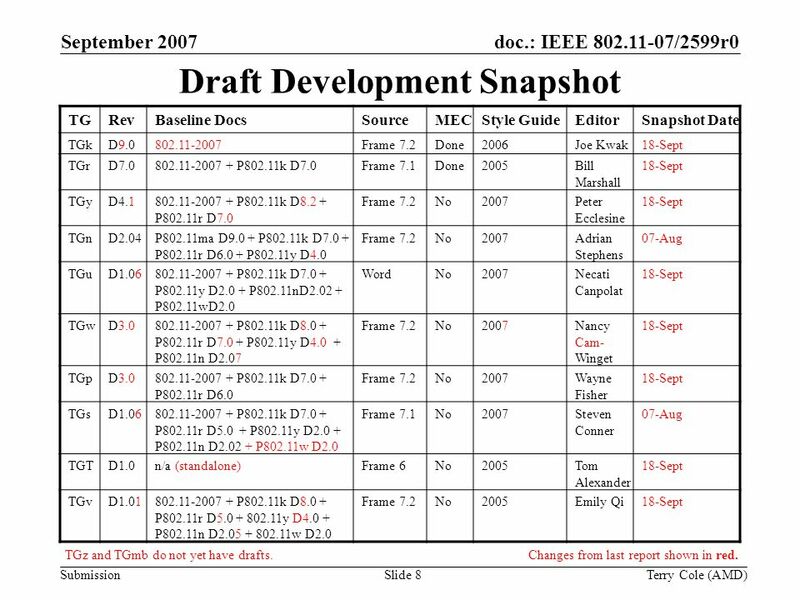 : IEEE 802.11-07/2599r0September 2007 Terry Cole (AMD)Slide 8 Draft Development Snapshot TGRevBaseline DocsSourceMECStyle GuideEditorSnapshot Date TGkD9.0802.11-2007Frame 7.2Done2006Joe Kwak18-Sept TGrD7.0802.11-2007 + P802.11k D7.0Frame 7.1Done2005Bill Marshall 18-Sept TGyD4.1802.11-2007 + P802.11k D8.2 + P802.11r D7.0 Frame 7.2No2007Peter Ecclesine 18-Sept TGnD2.04P802.11ma D9.0 + P802.11k D7.0 + P802.11r D6.0 + P802.11y D4.0 Frame 7.2No2007Adrian Stephens 07-Aug TGuD1.06802.11-2007 + P802.11k D7.0 + P802.11y D2.0 + P802.11nD2.02 + P802.11wD2.0 WordNo2007Necati Canpolat 18-Sept TGwD3.0802.11-2007 + P802.11k D8.0 + P802.11r D7.0 + P802.11y D4.0 + P802.11n D2.07 Frame 7.2No2007Nancy Cam- Winget 18-Sept TGpD3.0802.11-2007 + P802.11k D7.0 + P802.11r D6.0 Frame 7.2No2007Wayne Fisher 18-Sept TGsD1.06802.11-2007 + P802.11k D7.0 + P802.11r D5.0 + P802.11y D2.0 + P802.11n D2.02 + P802.11w D2.0 Frame 7.1No2007Steven Conner 07-Aug TGTD1.0n/a (standalone)Frame 6No2005Tom Alexander 18-Sept TGvD1.01802.11-2007 + P802.11k D8.0 + P802.11r D5.0 + 802.11y D4.0 + P802.11n D2.05 + 802.11w D2.0 Frame 7.2No2005Emily Qi18-Sept TGz and TGmb do not yet have drafts.Changes from last report shown in red. 9 Submission doc. 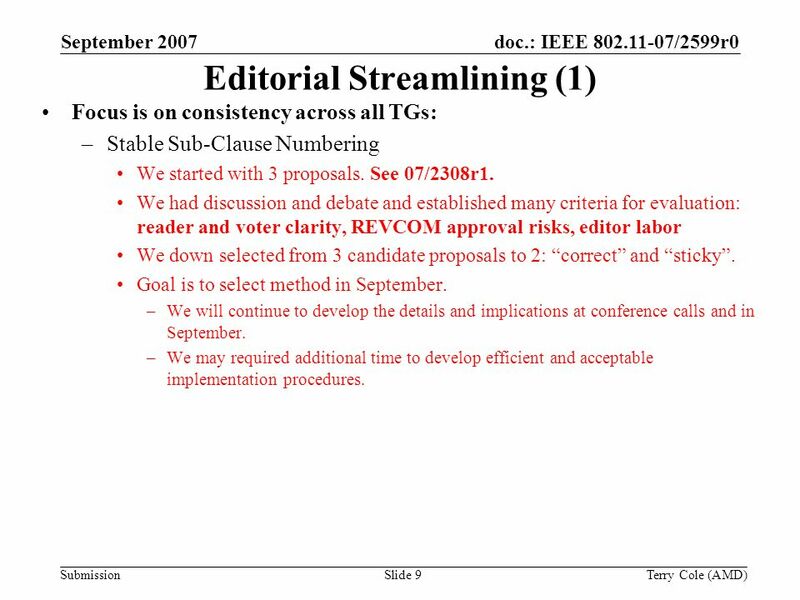 : IEEE 802.11-07/2599r0September 2007 Terry Cole (AMD)Slide 9 Editorial Streamlining (1) Focus is on consistency across all TGs: –Stable Sub-Clause Numbering We started with 3 proposals. See 07/2308r1. We had discussion and debate and established many criteria for evaluation: reader and voter clarity, REVCOM approval risks, editor labor We down selected from 3 candidate proposals to 2: correct and sticky. Goal is to select method in September. –We will continue to develop the details and implications at conference calls and in September. –We may required additional time to develop efficient and acceptable implementation procedures. Download ppt "Submission doc. 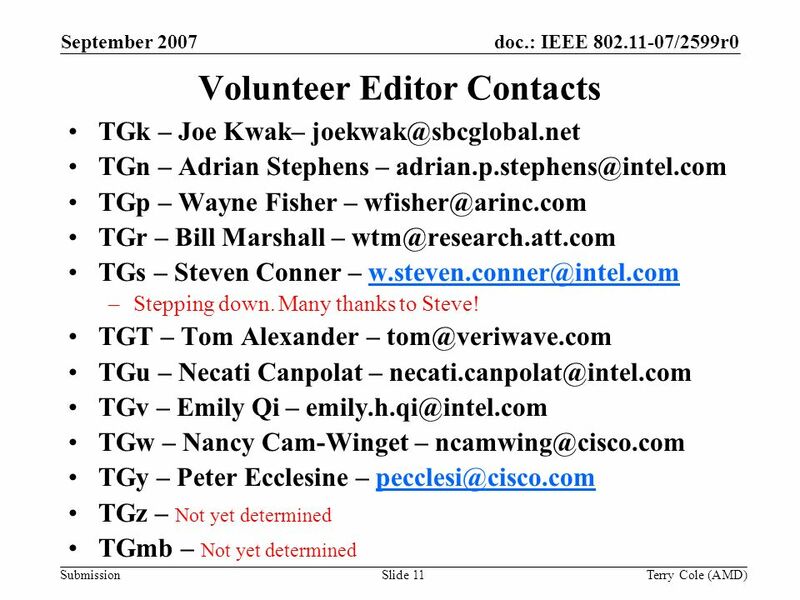 : IEEE 802.11-07/2599r0September 2007 Terry Cole (AMD)Slide 1 WG Technical Editors Closing Report Date: 2007-09-21 Authors:"
IEEE Working Group on Broadband Wireless Access (BWA) IEEE Gdoc. Doc. 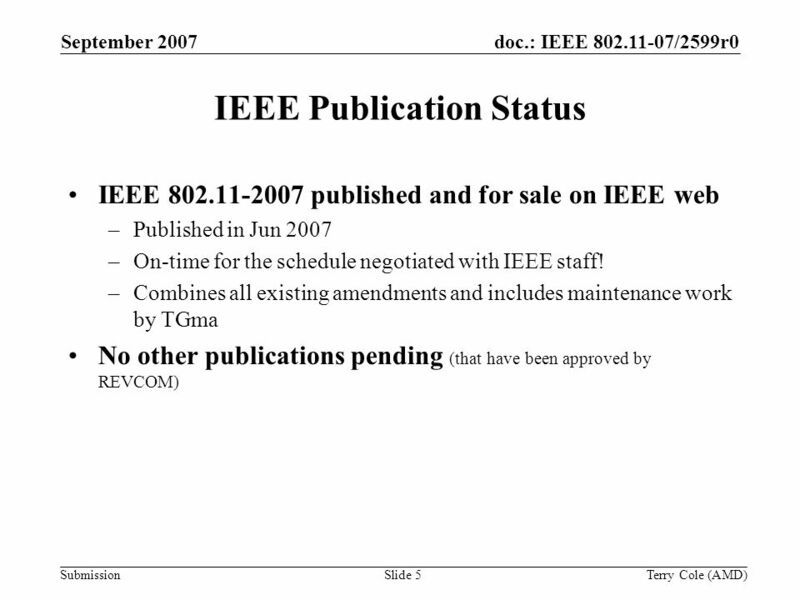 : IEEE 802.15-07-0656-00-wng0 Submission November, 2013 Pat Kinney, Kinney ConsultingSlide 1 Project: IEEE P802.15 Working Group for Wireless Personal.